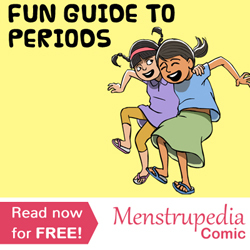 Sometime last year, Menstrupedia and Airplane Poetry Movement came together to host a series called Menstruation Diaries. What ensured was a beautiful thread of poems, performed by the poets themselves. We will be featuring all the performances on our blog in the coming weeks. Priyam Redican is a positive psychology consultant and trainer in India (Pune) and a spoken word poet, frequenting Youtube with her poignant takes on the shortcomings of the society with powerful words spoken with animation and emotion. You can check out her popular performance called Marriageable Age, where she is sure to make you smirk and think at the same time. Another power-packed performance of hers is that of Miscarriage Confessions, where she performs a poem inspired from the story of one of her patients. Don’t feel shy to give her a shout-out on Twitter if this poem spoke to you like it did to us! You can use the link below to do so.